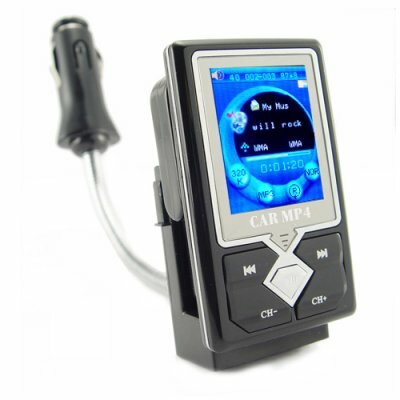 Successfully Added Car MP4 + MP3 Player with FM Stereo Transmitter (4GB) to your Shopping Cart. Car MP4 + MP3 Player with FM Stereo Transmitter (4GB). This car video and music player with FM stereo transmitter lets you play your digital media files (MP3/WMA/AMV) through your car's own stereo speakers. Do you want to listen to your favorite tunes while you drive? Of course you do! But buying CD's or burning your own mix discs is a hassle and expensive. This MP4 / MP3 player with FM transmitter is the budget audio and video solution that your car is begging for. This small gadget lets you play your own selection of favorites with the built-in screen for viewing while the sound plays directly through your vehicle's stereo system. Your songs, your videos, your car, your stereo system: what could be better? Setting up the CVHV-CS14 is easy. Load up your digital media files with the USB cable, pop the player into its car adaptor, plug the car adaptor into your cigarette port, choose an FM station to broadcast to, and get ready to rock n' roll, or rap, or pop, or catch up on the last episode of your favorite TV show that you downloaded last night, whatever you choose! Easy navigation with onboard buttons or remote control lets you keep your hands on the wheel and your eyes on what's important: that hottie in the next lane. A 1.7 inch color LCD screen and a bright, easy-to-read display makes cycling through your songs quick and easy. This player has shuffle (random) and last song position memory, and a huge 4GB's of memory so you'll have plenty of room to store all of your favorite jams. If you need more space, just pop in a micro-SD memory card. When you reach your destination, slip the MP4 / MP3 player into your pocket and take your music with you. That's right, this model has the ability to be used as a portable media player as well. Headphones and an internal battery let you enjoy this gadget while driving or walking. Everyday practicality, high quality design, large internal memory, and ease of use make this item a guaranteed winner. Take advantage of Chinavasion's wholesale prices to order one for yourself, then list this item on eBay and let us dropship directly to your customer's door. You can also order in bulk for better discounts plus saving on shipping. Simple and portable MP4 + MP3 player for vehicles. Transmits audio via FM transmission directly to your car's speakers. Shuffle and last song position memory. 1.7 Inch LCD display for viewing video files and audio file information. Micro SD memory card slot for even more music and video files. Note: This product plays MP3 and WMA music files. Video files need to be in the AMV file format. We recommend using software such as "MP3 Player Utilities 4.10" or "MP3 Player Utilities 3.68" from sites like www.s1mp3.org to convert your existing video files into AMV format files. Plays AMV video files. You can convert all these file types to AMV with software - AVI, MPG, DAT, WMV, ASF, RM, RMVB, MOV, QT, VOB. How do I put my music on this MP4 player? You can use the USB cable to load music from your computer directly on to the player. If you have a micro SD card, first put the card into the MP4 player, connect to your computer and format the micro SD card. Then load your songs onto the micro SD card, and you're ready to go. How do I charge this MP4 player? You can charge the MP4 through the cigarette port adapter or directly through a USB cable connected to a computer. Which FM channel should I broadcast to? It's best to transmit to an FM station with no signal in your area. This way there will be no interference with the MP4 player's signal. How do I navigate through the menus? Either hold down the right "CH" button on the MP4 player itself, or press the "Menu" button on the remote control. Be sure to be patient and give the MP4 player plenty of time to respond before you press another button. Patience has its rewards with this MP4 player!